Markets awoke in a sour mood last night as the weather forecasts look to improve as we march ahead through June. It is hot and getting very dry in these parts, current conditions reflect the price action from last week but the forecasts reflect some moisture and a slight cool down. Corn and wheat are off more than 1% this morning while beans are not far behind. Cotton prices are not following the CBOT lower this morning, December futures are up fractionally from Friday’s close. The summer row crops are in their normal, summer markets right now with weather acting as the main driver of price but this week it will step aside for the Federal Reserve on Wednesday. The last quarter has been weak for the USD, commodities in general have had a decent time trying to trade higher but that could come to an abrupt end on Wednesday if the Fed hikes rates. For the first time in six weeks, USD bets have been increasing. So while I certainly look to put some of the blame for the grain set back this morning on weather changes, it could be the outlook for a stronger dollar in the weeks/months ahead. Below is a chart of the recent price action in the dollar. 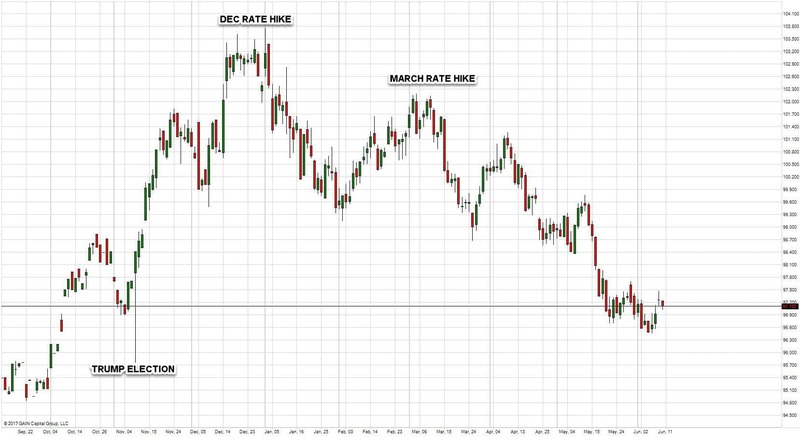 Running up into the December meeting and the March meeting where rates did move, the dollar rallied. It has not this time which tells me maybe the market is in for a surprise. 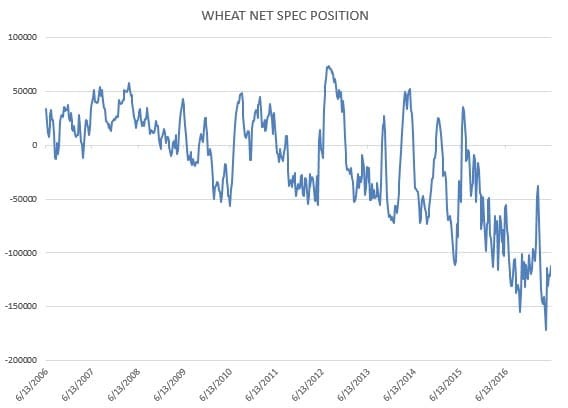 I remain long grain volatility (buy calls/puts or both) with the weather, the fed and July option expiration on the horizon driving a trade shake up- in my opinion. WASDE on Friday was apparently a non event as prices have digested the numbers very quickly. I found it neutral to slightly bearish for the CBOT markets given the lack of story change, and VERY bearish for cotton. The USDA dropped cotton exports from 13.5 million bales to 13 million for next year. That takes the carryout from 5.0 million bales to 5.5 million for 17-18. 16-17 carry out sits around 3.2 million, so we are looking at a massive jump in supply. I am scratching my head as to why we have not seen more selling in December 17 futures. There is a saying in fundamental analysis that says a market that does not break on bearish data is not bearish. It has me concerned being hedged where I am between 71 and 75 cents but the data is bearish and I can’t prices hanging here longer term. The forecasts are all over the place this morning. They are calling for rain, but the models are changing locations. It is mostly out east right now. It is agreed though that temps will be changing. The weekend was drier than expected across the central belt with very few showers spotted. With a cool down should come some calm to price, but forecasts are made to be changed and we have a critical six weeks ahead, be ready for anything. 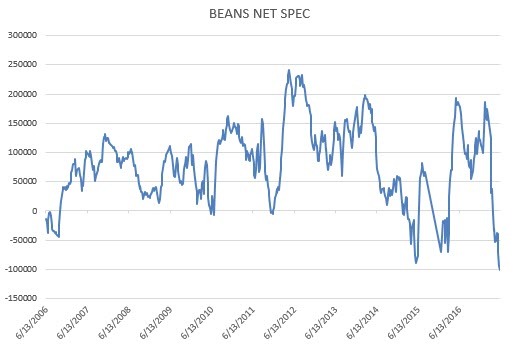 It is a normal USDA report week, we get our first look at bean conditions this week. Wheat harvest will be starting to ramp up as well. July option expiration is next week, which should bring fireworks as well. 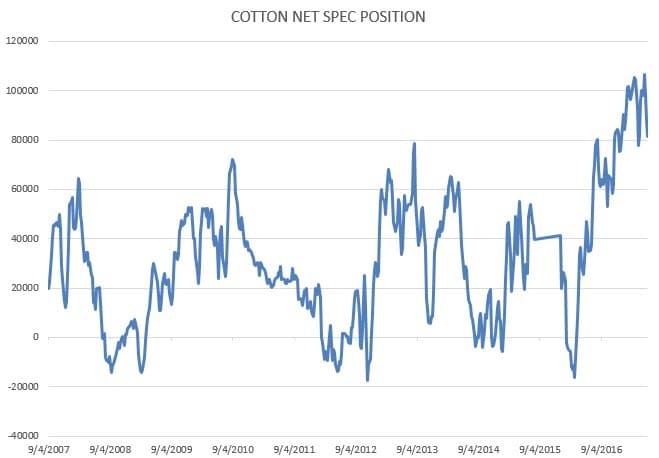 The net open interest picture shows extremes with funds building positions on both the long and short side on the CBOT, while in cotton we have seen a contraction in long positions but no new shorting. The potential for massive swings has seldom been higher. 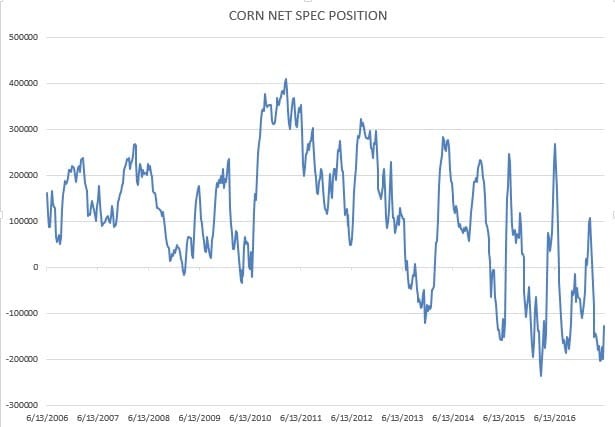 I posted the net fund picture below, but wanted to pull out each leg for corn. 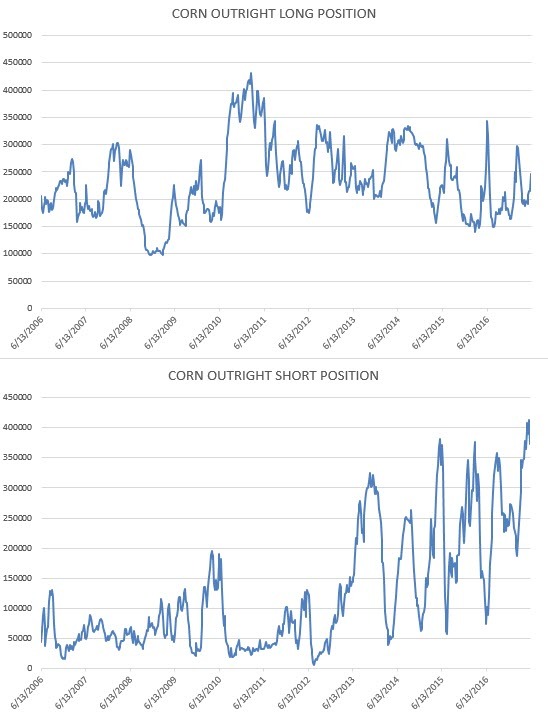 As you can see in corn, outright longs are at levels not seen since February. I really like long volatility strategies here like strangles or straddles. John Payne is a Senior Futures & Options Broker and Market Strategist with Daniels Trading. He is the publisher of the grain focused newsletter called This Week in Grain, along with being a co-editor of Andy Daniels’s newsletter, Grain Analyst. He has been working as a series 3 registered broker since 2008. John graduated from the University of Iowa with a degree in economics. After school, John embarked on a 4 year career with the United States Navy. It was during two tours in Iraq and the Persian Gulf where John realized how important commodities are to the survival of society as we know it. It was this understanding that brought about John’s curiosity in commodities. Upon his honorable discharge in 2007, John’s intense interest in the world of commodities inspired him to move to Chicago and pursue his passion in a career in the futures arena. After a three year position with a managed futures firm specialized in livestock trading, he was given the opportunity to join the team at Daniels Trading. Being in the business and seeing how other IB’s operated, it was the integrity and straightforward approach of the Daniels management team and brokers that attracted him to make the move. Since joining Daniels, John has broadened his fundamental and technical analysis of the markets even further. John has been writing his newsletter This Week in Grain under the Daniels banner since 2011. Working in high pressure industries like the military and capital markets, John has learned the value of preparation in times of stress. He believes that instilling within his clients the value of a good plan and a cool head for dealing with the day to day swings of commodity markets. He treats every client as a teammate, understanding that his job is to help clients achieve their goals, whatever they may be. John is a proud supporter of the Iraq and Afghanistan Veterans of America, the Veterans of Foreign Wars and the National Corn Growers Association. When he is not working, he enjoys athletics of all kinds and spending time with his wife and their two kids.